The first suspect cases this season of anthracnose have been reported in white beans. This is the time of year when we typically first begin to see symptoms and is a good reminder for the need to scout your fields through to leaf drop. Anthracnose is a potentially devastating seed-borne disease that can affect all classes of beans, impacting both yield and quality. Anthracnose is also very costly to the Ontario dry bean industry affecting our reputation as source of quality commercial product and costly and time consuming process for dealers to remove discoloured beans. In 2010 a major outbreak of the disease occurred in white beans and dealers implemented a special discount schedule for anthracnose infected samples because of the high incidence of the disease. Ontario Grown Seed has higher risk: While the disease can affect all classes of edible beans, western produced seed has been problem free. 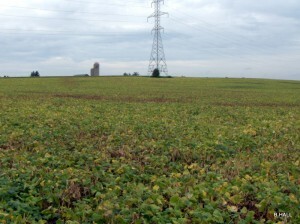 Ontario produced seed has added risk because of our suitable environment for the disease. 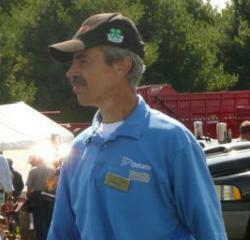 Most Ontario produced seed receives a fungicide for anthracnose, and field inspections. There were no reports of anthracnose infected fields in 2013. 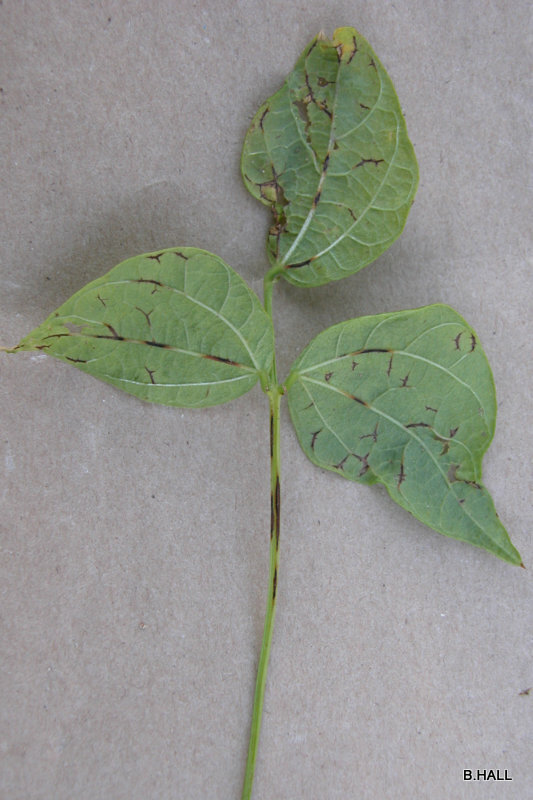 Scouting Leaf symptoms first appear on the underside of the leaf surface along the veins, which show a brick red to purplish-red discolouration. Later such discolouration also appears on the upper leaf surface. 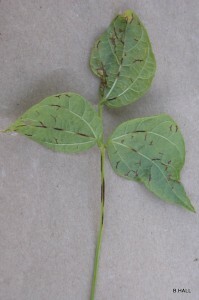 On stems, dark brown eye-spots develop lengthwise along the stem. Pods develop rusty-brown spots that later become brown sunken cankers which may contain pink to flesh coloured masses of spores. the borders of cankers are well defined by a dark brown rim. 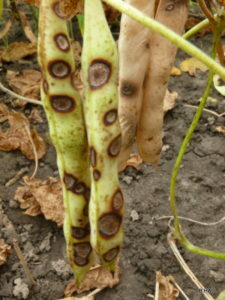 Seed from infected pods will show brown to light chocolate coloured spots on the seed coat. Focus scouting to low lying areas, water runs and along fence rows and headlands of fields where the disease often first appears, because anthracnose is spread by movement of water in a field. Optimum disease control will be obtained when a protectant fungicide, Headline (BASF) or Quadris (Syngenta) is applied prior to establishment of anthracnose. Optimum timing of first application is at 20-50% bloom stage to minimize yield losses and seed infection. If infection is detected prior to bloom, fungicide application is warranted in reducing the disease spread, but a second application may be required to protect pod and seed development. Applications at late flower or pod fill are not always effective in reducing yield losses or preventing a high level of seed infection depending on the amount of infection that is present at time of application. Both Headline and Quadris are very effective and can help limit the spread of the disease that may already be present in a field if detected early. The initial early application of fungicide at flowering is designed to protect yield and quality, while a later application during pod fill can limit seed infection and discolouration. Long term research trials conducted by Chris Gillard, RCAT, University of Guelph indicate that Headline is slightly more effective than Quadris when disease pressure is high. A later or second application of fungicide may be required 10-14 days later the initial application timing if wet weather continues and or a dense crop canopy exits. The pre-harvest interval for Quadris is 15 days and 30 days for Headline.